Saturday the 6th- TONIGHT, look for the Ghostbuster car to arrive at Dent. It will come blazing down Harrison Ave. and will park right in front of the haunted school. Arrival time is set for around 9/9:30pm. 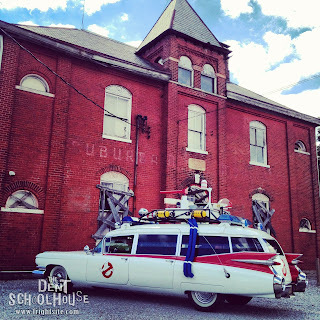 Grab a scare a photo with the Ghostbuster car at The Dent Schoolhouse! Next Dent makes Top 13 List!